Protein is one of the most satiating nutrients, and it can fill you up and keep you full for extended periods of time. So, protein bars can work in weight-loss plans as long as they’re balanced with other healthy, low-calorie foods. 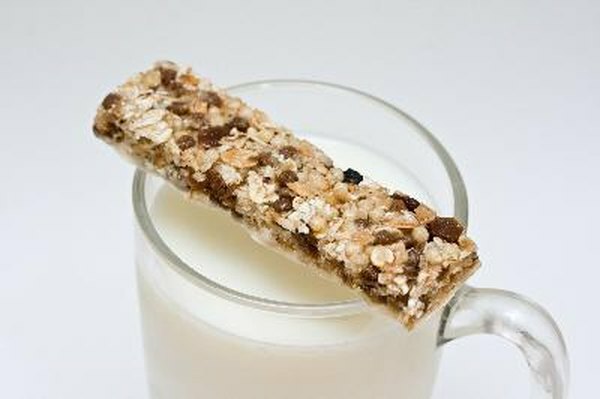 To avoid overeating, try including protein bars in your eating plan as meal replacements rather than snacks. Every protein bar is made differently, and some are healthier than others. For weight loss, look for bars that are high in protein but that don’t have a lot of fat grams or added sugar or a high calorie count. A 50 g commercially prepared caramel nut protein bar has about 210 calories, 12.5 g protein, 6.25 g fat, 25 g carbohydrates, 6 g fiber and 14.5 g sugar. Because a typical protein bar can top 200 calories, it’s helpful to have a bar as part of a small meal or as a meal replacement instead of eating it as a snack. If you eat a bar every day in addition to your regular meals, you may end up taking in too many calories to lose weight. However, using high-protein meal replacements can be a successful weight loss strategy. According to research published in the November 2003 "Nutrition Journal," a 40-week research trial of obese and overweight participants found those who used daily meal replacements lost more weight than those who followed a low-calorie diet. Protein is a key nutrient in the quest for weight loss, but it’s not the only factor in the equation. The safest and most reliable way to take weight off is to follow a low-calorie diet that includes a balance of foods across all main groups, including fruits, vegetables, grains and dairy as well as proteins. Relying too much on protein bars as a weight-loss aid could rob you of other essential nutrients that your body needs to function at its best and stay healthy as you slim down. Following a high-protein diet for an extended period can result in negative health effects. According to Katherine Zeratsky, registered dietitian at MayoClinic.com, high-protein diets may be more likely to cause or intensify liver and kidney problems as well as increase the risks of constipation, heart disease and cancer. In the short term of three or four months, however, high-protein diets can healthfully aid weight loss. Before you start such a diet or make any significant changes to the way you eat, speak with your physician, especially if you have any type of chronic health condition.